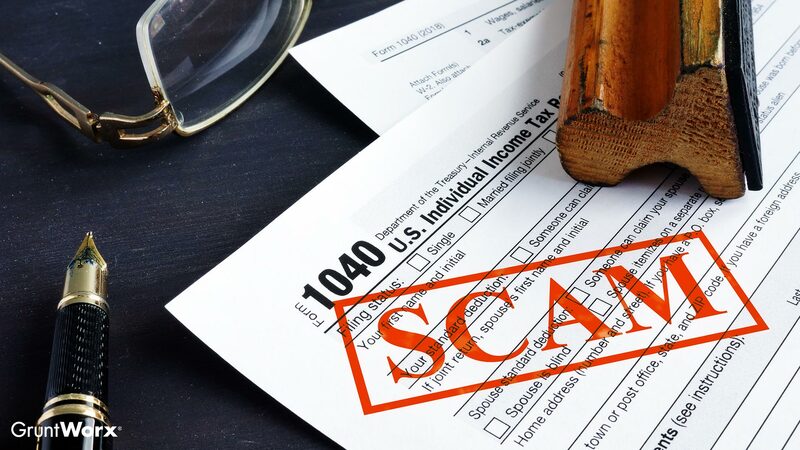 The IRS 2019 “Dirty Dozen” Tax Scams - GruntWorx, LLC. Each filing season, the IRS releases a list of the twelve tax-related scams that either target or are used by taxpayers: the so-called “Dirty Dozen.” Every day for twelve weekdays, the agency spotlights a new scam that can cause serious trouble for taxpayers. Since we tend to focus on data security, it only makes sense to walk through the scams the federal tax authority has highlighted. If you’ve spent any time reading the GruntWorx blog, some of these scams will certainly sound familiar, and long-time paid tax return preparers will recognize the tried-and-true schemes that some use to avoid paying tax. Perhaps the most prevalent method on the list, email and website scams try to trick taxpayers into handing over their personally identifiable information (PII)—or simply sending payment—to fraudsters. Defending against electronic phishing scams means learning about each type of scam, installing security software on any device handling sensitive information, being discrete with what you share online, and more. If you’ve ever received a phone call from “an IRS agent” angrily demanding you send them money in the form of iTunes cards, you’ve been targeted by this scam. They take many forms, but they tend to follow a familiar format: pose as someone from a law-enforcement agency or trusted business, act aggressive while on the phone, demand immediate payment, and threaten legal consequences (jail time and deportation are common) for noncompliance. And, as the IRS points out, they won’t ever call to demand payment or threaten jail time. While the first unveiled scam involves electronic identity theft, the IRS used this entry to highlight the fact that identity thieves are hard at “work” all year long. Besides, scammers don’t limit themselves to email, website, and phone scams; identity thieves are more than happy to literally rifle through your trash or pick your pocket when you’re in a crowded public space. Remember to take steps to protect your private data—both the analogue and digital varieties. Any paid tax return preparer who guarantees they can get you a larger refund than any other practice in the area should make your “Spidey Sense” start tingling. The IRS says that one of the preparers’ methods is to recommend you claim credits for which you don’t qualify. Unfortunately, having someone else prepare your return doesn’t insulate you from the consequences: It’s your name on the signature line. The possibility of getting extra money from the IRS seems to be incentive enough for some taxpayers to falsely claim income to qualify for certain credits (the IRS pegs the Earned Income Credit as a particularly ripe target). It’s never a good idea claim you donated more to charity than you actually did, and doing so can land you a front-row seat to a criminal prosecution (hint: you would be the star). Overstating deductions and claiming credits that you don’t qualify for are classic tax scams, but they can be costly if you’re caught. If you’re worried about being able to pay your tax bill, a safer bet would be to ask the IRS for a payment plan. Possibly the most morally reprehensible scam of the “Dozen,” fraudsters will create fake charities that have names closely resembling legitimate organizations to trick well-meaning taxpayers. Yes, there are criminals so craven that they would try to take money that would otherwise go to causes, like St. Jude’s Hospital. Unfortunately, that means you have to be diligent and do your homework. Luckily, the IRS provides a list of legitimate charities that can help you avoid getting scammed. The two credits the IRS says are frequently improperly claimed by businesses are the Research Credit and Fuel Tax Credit. If you’re looking to legitimately claim either one, the IRS says you need to document your qualifying activities. If you’re interested in scamming the IRS, just don’t. Hiding money in offshore banks may be a tired crime drama trope, but that doesn’t mean the practice isn’t very real. The IRS kindly reminded taxpayers that taking part in this scam can have some pretty stiff legal consequences and that it’s best if they start paying up as soon as possible. Besides, you don’t want to be a Hollywood villain cliché, do you? We’ve all been there: Your estranged uncle angrily declares, “I ain’t gotta pay taxes, ‘cuz I heard the Feds can only tax foreign income!” Well, it turns out that he is considering what the IRS calls “frivolous tax arguments.” As it turns out, people have tried arguing a number of reasons that they don’t have to pay taxes—from religious exemptions to the illegitimacy of the Sixteenth Amendment. Unfortunately, if they follow through on those schemes, they could face “criminal prosecution … [and] a variety of civil penalties.” In other words, don’t try it. To read more about these scams, visit the IRS’ “Dirty Dozen” landing page. Each bullet has a link to the “scam of the day,” so learning more about some of the creative scams being encouraged by fraudsters is as easy as clicking some blue text. As with anything involving defrauding the IRS, tax professionals who recommend clients engage in any scams could face legal trouble.